Today at 1:30 p.m., Minnie Hawkins and her grandson Khalil, 14, received a Bible, a blanket and the keys to their new house in Minden, La. She is the last of the 5th anniversary build dedications that started Saturday in Shreveport. 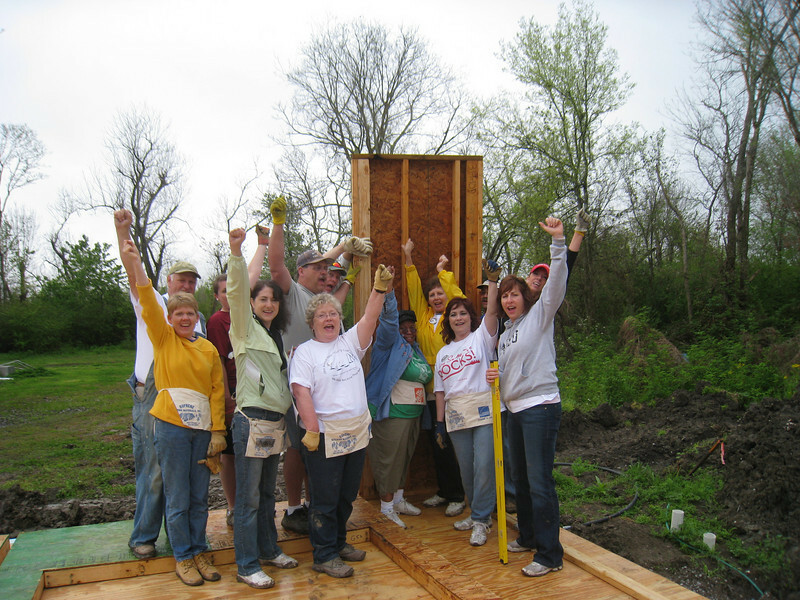 Thanks to hundreds of volunteers from as far away as California, Idaho, New York and Georgia, The Fuller Center honored its first project – started in 2005 – by returning to Louisiana to build one house for each year of success. Minnie’s house is ready for her to move in, thanks to the finishing work done during the past two weeks by Fuller Center RV Builders. The hard work of an Americorps NCCC team, students from the University of Cincinnati and Saint Anselm College in New Hampshire built her house in four and a half months. She can now move out of a one-room shack and into a simple, decent house next door to her mother. 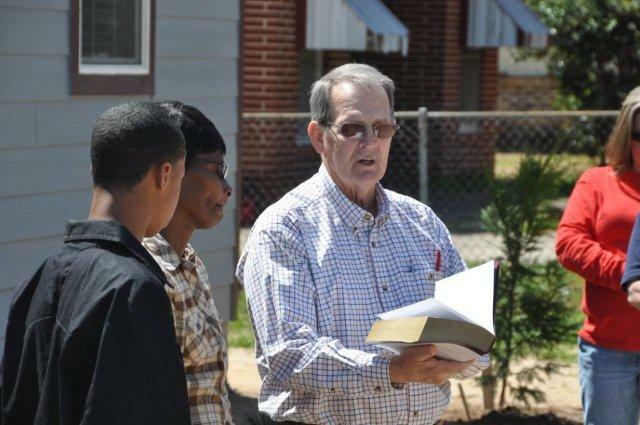 In Springhill, the Page family house was dedicated on Wednesday with the team from California and Oregon. In one week, the volunteers moved the project from a blank slab to a fully-roofed house that is "in the dry" and ready for insulation and wiring. Local volunteers, including members of the Pleasant Valley United Methodist Church near Minden, will help finish the house. It was an especially moving moment for Travis Page, who has volunteered on several Habitat and Fuller Center houses owned by friends and has seen first-hand how they improve lives. He and his wife applied last November, and very soon will have a new home of their own. "This team was such a blessing. The work went much faster than I expected," said Charlie Park, director of The Fuller Center of Webster Parish, based in Springhill. "As soon as I get the inspector out there, we can finish!" The house in the New Orleans neighborhood of Belle Chasse was dedicated on Thursday. Despite rain delays that pushed the project back one week, the volunteers worked hard to clean up the neighborhood, set the foundation and raise the walls. Mama Black’s home is the first project of the Northshore Fuller Center, based in Hammond, La. These five houses bring The Fuller Center’s total to 655 houses built in five years, a tremendous accomplishment for a grassroots, volunteer-driven ministry. It’s not too late to write a special 5th anniversary message in our guestbook or make a special 5th anniversary contribution. All donations right now are being matched by our friends Ted and Veda Stanley (up to $250,000), so whatever you can give will be doubled. Want to know what it’s like to be a part of a Fuller Center project? Check out our photo galleries and videos from the 5th anniversary build and read stories about the five projects. Interested in learning more about The Fuller Center’s history? Read about it here.